The convertible version of Porsche’s new 911 has been revealed. It’ll go on sale in the UK in March 2012, priced from £79,947. It comes with a folding fabric roof, which is designed to give the Cabriolet the same silhouette as its hard top companion. The roof frame is specially designed to be lightweight, and that, along with weight savings in other areas, means the new 911 cabriolet is lighter than the outgoing model – good news for both performance and fuel economy. As with the hardtop coupe version of the new 911, the Cabriolet features a wider front track, longer wheelbase and electro-mechanical power steering, with the aim of offering a more involving driving experience. Engines are the same as in the coupe – there’s a 350bhp, 3.4-litre flat-six in the £79,947 Carrera model and a 400bhp, 3.8-litre flat-six in the £89,740 Carrera S. Both engines drive the rear wheels by way of a seven-speed manual gearbox and both return more than 28mpg. Available as an option is the seven speed PDK double-clutch transmission, which reduces 0-60mph sprint times and improves fuel consumption. 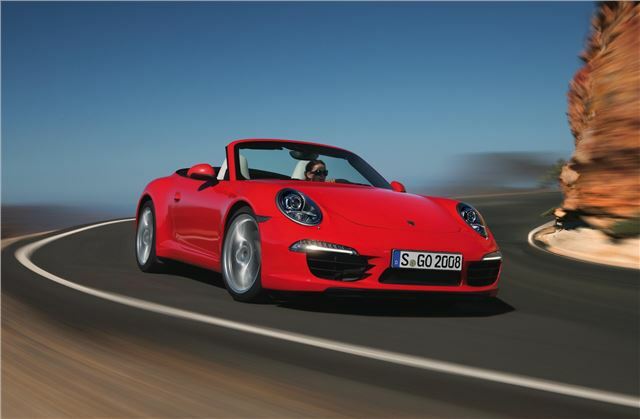 The 911 Cabriolet goes on sale in March 3 2012, and buyers will be able to take a complimentary course at the Porsche Experience Centre, Silverstone, in order to explore the potential of their new car.